Dormant pruning relies on the same principles of maintenance pruning except that the plant is pruned while dormant to reduce stress to the plant. 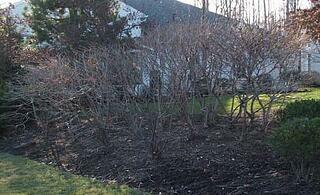 Dormant pruning is often more aggressive, with larger cuts being made to create more vigorous growth in the spring, which leads to a healthier shrub or tree. Training trees by scaffolding the branches may be done while dormant to eliminate any weak crotch angles or rubbing branches. A plant may be "thinned" while dormant, thus opening up the form or canopy and allowing light and air to circulate. Thinning helps reduce size: as much as one-third of the plant may be removed. As a technique, thinning also encourages healthy internal growth during the next growing season. Dormant (winter) pruning may also be completed while plants are dormant. This technique helps reduce vastly overgrown plants and force new growth to rejuvenate the plant. The process may often take 2-3 years to complete but costs far less than re-landscaping. Shrubs such as spirea, privet, taxus, forsythia, lilac, burning bush, and viburnum respond very well to this type of pruning. Ornamental trees like crabapples and cherries also tolerate and benefit from this practice. Deciduous plants produce woody growth and drop their leaves in the fall. With dormant pruning, the oldest branches are removed at ground level or from inside the plant to open it up and reduce size. Many shrubs flowering from new wood respond very well to dormant pruning, becoming healthier and producing vigorous blooms. Damage caused by shearing is corrected at this time as well. Evergreens are plants that retain their leaves or needles throughout the entire year. While needle-leaf evergreens do not respond well to pruning in general, narrow-leaf and broadleaf evergreens are great candidates for dormant pruning. When pruning an evergreen, holes are created in the canopy to allow light to reach the internal branches. This prevents the plant from becoming excessively woody and reduces insect, disease, and possible weather damage. Again, this service includes time to correct any damage caused by shearing. Our dormant pruning occurs from late November through mid-March. 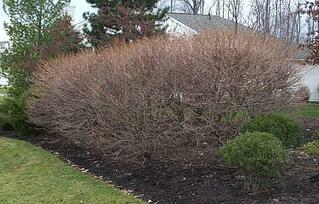 Throughout this season, landscape plants have entered their dormancy period. This time of natural hibernation allows us to prune with great detail... all without jeopardizing the health and vitality of your plants!